This shot can be made so the average player cannot tell what has happened. He knows the shot was not “on”. The balls must be arranged in a similar manner as the ones you see diagrammed. “whitey” and the nine are lined up straight in the pocket. 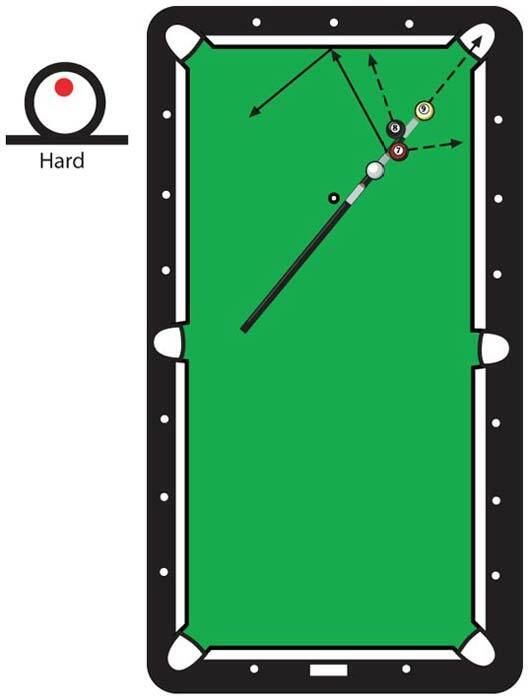 The two interfering balls, the 7 and 8, are angled not only to clear the way for the one coming cuestick, but to deflect “whitey” out of its path also. The nine goes in the pocket like a bullet. I advise you not to try this technique in a stakes game with anyone other than amatuers. You may get thumbs busted. Do the shot over in slow motion for those who thought it was legit.